Speakman is a pretty cool brand. Most of their products are unique and buck a lot of the rends that many others stick to, making them pretty refreshing to look at during long research sessions. If you haven’t heard of them before, hopefully this look at some of the best ones I can find (and how I chose them) will encourage you to give them a second look. Solid brass, and more than solid performance. I like this one. It may not look like much at first, but it’s one of the most customizable Speakman shower heads on the market. Being made of solid brass is a bonus (though again, you have to remember to take care of it). It has a good flow and its nozzles are self cleaning, rounding out the basic package. The real claim to fame here is that each of its six jets can be individually adjusted to the user’s tastes, creating a shower with 48 possible combinations of jets firing at once. While it lacks a true massage function, this shower head will give you the water targeted in whatever pattern you choose, which is great! The only real downside is that the changing process isn’t exactly at the touch of a button and swapping between configurations on the fly isn’t going to be something you want to do too often. If you share the shower with someone it could also be an issue. Think of sharing a car and how you have to fix your mirrors, seat, and vents every time you sit in it after the other person does (It can get annoying, is all I’m saying). But that’s hardly ITS fault. While a bit expensive (between $100 and $150), it’s worth it for a solid brass, 2.5 GPM, highly adjustable shower head. Pretty cool pressure boosting design. At first glance, this is just your standard traditional shower head with a gimmicky swirl pattern on the front. 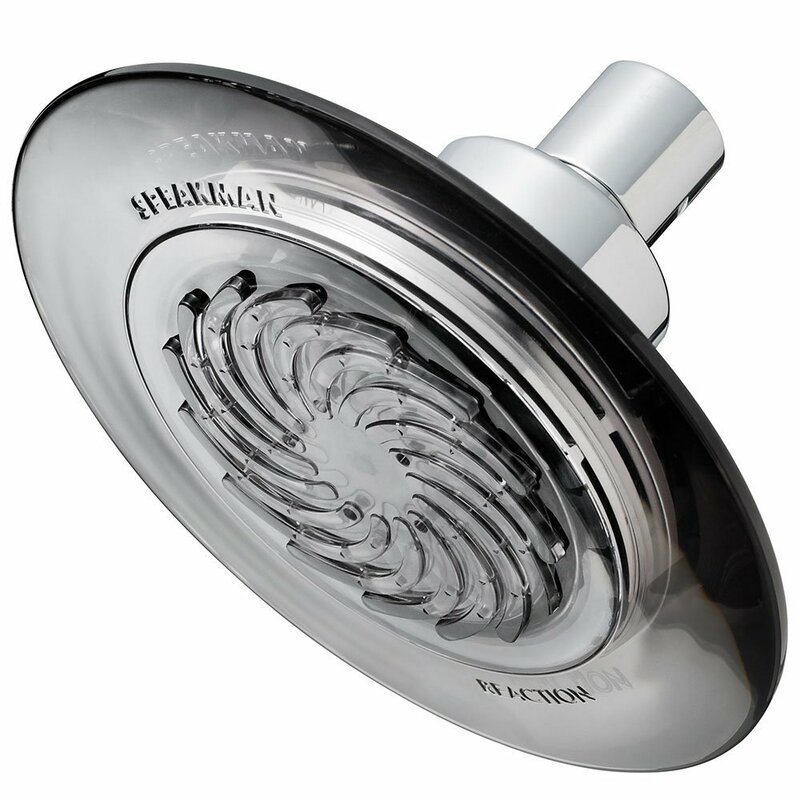 That swirl pattern however belies this Speakman shower head’s true power: that of an internal turbine that spins and boosts the water coming through it. While it works at 2.0 to 2.5 GPM by default, it’s more than capable of pressure boosting lower flows, making it a great shower for low flow situations. It only has the one trick, unfortunately, but for a relatively cheap (a little over $50) pressure boosting shower head it’s not too shabby. Speakman’s take on the traditional multi setting unit. 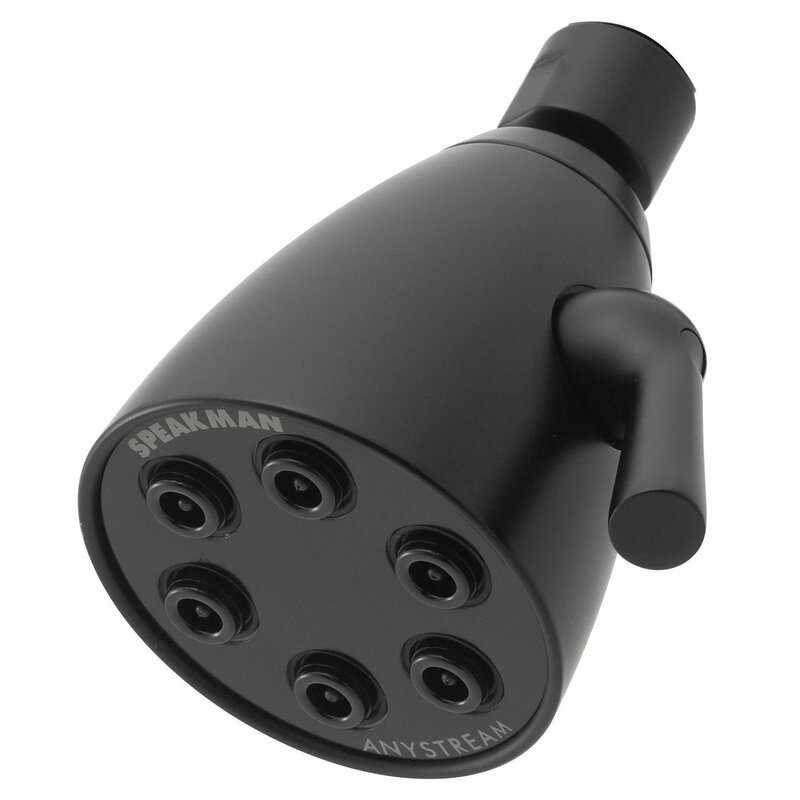 This one is pretty much exactly what its name says: a multi function (five to be exact) Speakman shower head with a roughly 5 inch face and simple plastic and chrome design. It’s not much to talk about or look at, but as a cheap multi setting unit it has everything I really want. “Intense” is its basic full body spray, and it comes with massage, flood, and “rain” along with one of my favorites: the pause feature. Unlike the other Anystream this one clicks through its settings quickly instead of each jet needing to be cycled through until you find the right configuration. All in all, pretty good for under $30. A simple, yet effective handheld Speakman product. Pretty nice looking. While plastic and chrome (it also comes in black or nickel finishes), that’s not necessarily bad for a handheld (which should be light and easy to hold). This one comes with a variety of spray settings, though unfortunately no pause function. Still, it utilizes the same Anystream 360 technology as our winner (letting you cycle through any combo of jets) and also has nine tiny pulsating massage jets in the center. A stylish bell shaped rainfall. The 5 inch wide face is a bit small for a rainfall, but not out of the realm of reason. It has the requisite number of holes (108 is about what I consider the minimum for a rainfall type), which gives it a very even, thick fall of rain. 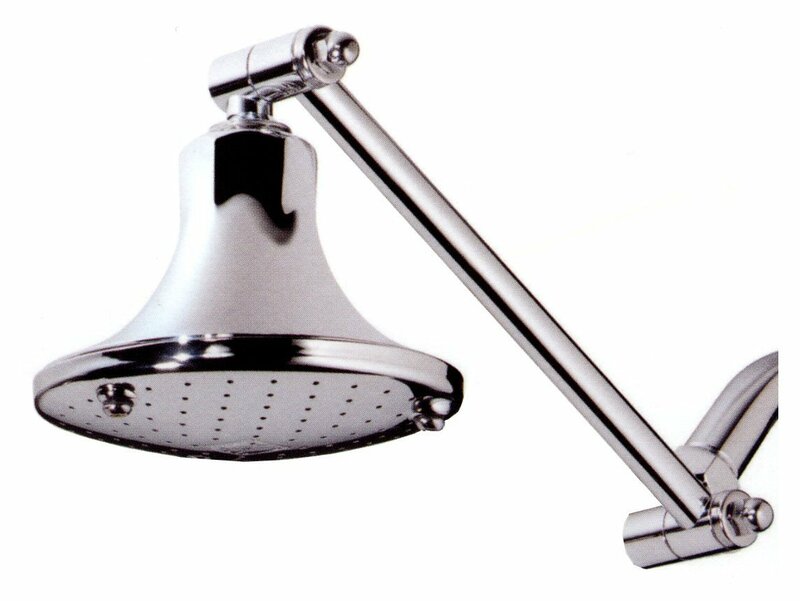 The arm is adjustable up to 20 inches and can be tightened and locked with a key to prevent accidental jostling from completely throwing off your groove in the shower, perfect for something you want directly overhead with no angling. One interesting feature that made it sneak on this list above a few other runners up is it has an easily removable flow restrictor for people that like a higher flow in their shower, which is always a great option to have. While a bit expensive at somewhat under $150, it’s a great Speakman rainfall and falls within the expected price range for well constructed members of that shower head family. Frankly, I like all of these just about equally. They’re all different enough I could see myself recommending any of them to someone depending on what they like. The Speakman S-2552 Anystream takes the top primarily because of the extra sturdy construction (brass doesn’t just give out on you like plastic might) and the fact that it has the widest range of visual styles (it comes in all shapes and colors with otherwise identical function, something I didn’t talk about in the entry), but all of its brothers and sisters are pretty great as well. Are you interested in checking out other brands? The two main interesting things about Speakman shower heads are their materials and design, while the price is always a concern (for those of us not rolling in money). Let’s go over all three real quick. 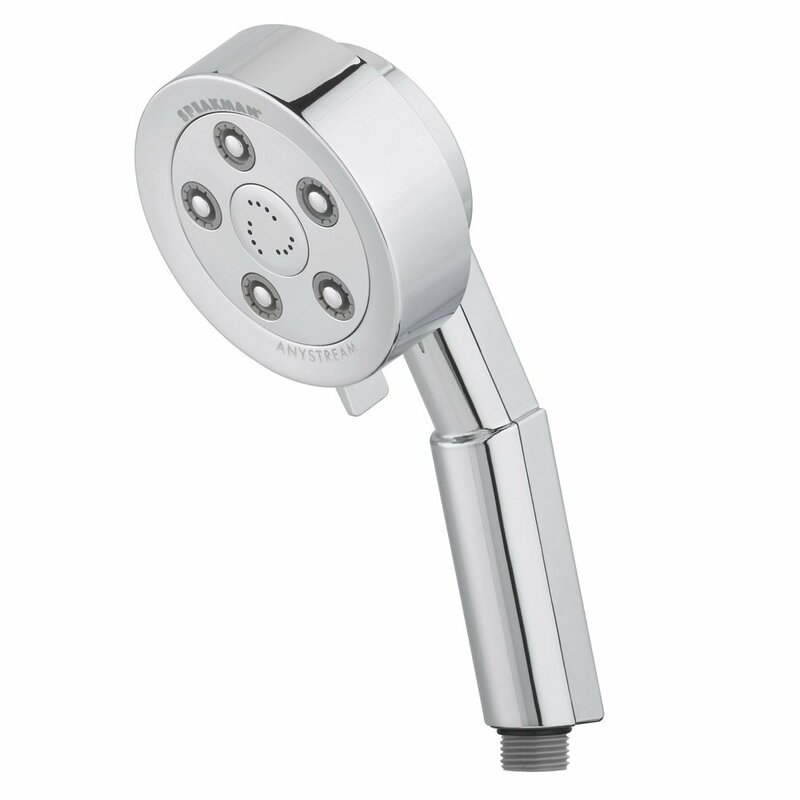 Speakman shower heads tend to be made of plastic or metal (usually stainless steel) like most products, though there is one exception: some are made of solid brass. These have their ups and downs. On the one hand, brass is a very sturdy, long lasting material. Many antique fixtures in old homes were made of bronze or brass (and sometimes copper), and if well taken care of they can easily last generations. Therein lies the caveat: “if well taken care of”. Unlike plastic or stainless steel, brass can and will corrode if you fall down on the job of cleaning it, and may require a slight bit of scrubbing every once in a while (with something soft, so you don’t scratch the finish). If you don’t, there is often no outward appearance change, but the metal becomes brittle and prone to cracking, the tin in the alloy invisibly eroding away. In short: brass is good, but needs proper care. Make sure you give it such. 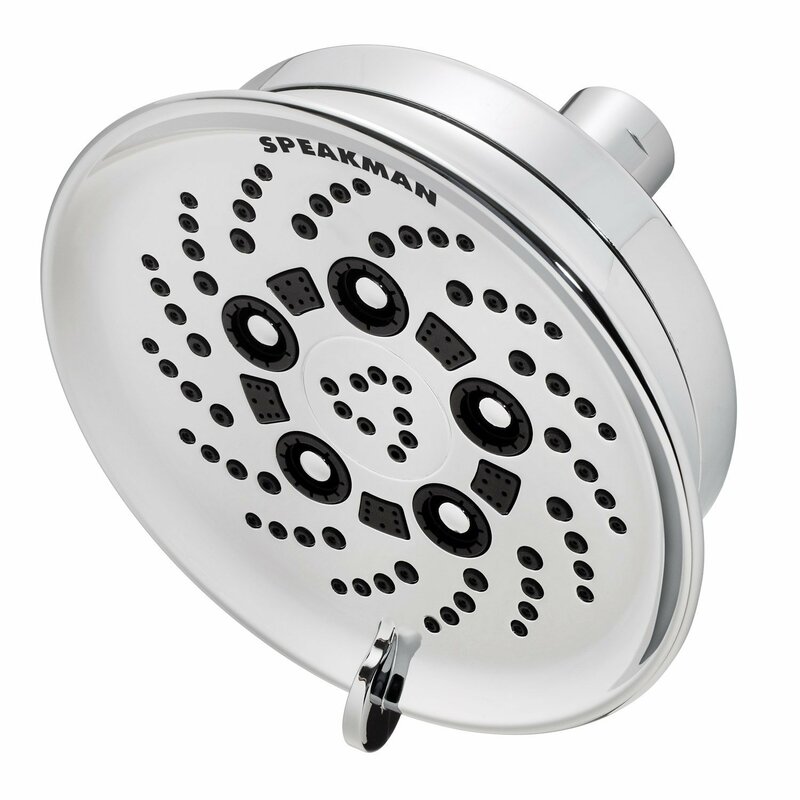 Speakman shower heads come in every design you’re likely to think of, from traditional, and handheld, to rainfall. Many of these have their own twist on the concept that adds some new and unique to talk about, which I’ll get to when they come up. Still, you’re looking in many cases for the same things as every other product: if it has settings, it should have a jet, massage, and full spray at a minimum, and rainfall shower heads should hang directly above your head. Speakman shower heads run the full gamut of prices, from under $30 to over $100. Keep that in mind when purchasing, and note that the primary materials exist on a sliding scale of expense: plastic is cheaper than stainless steel which is in turn cheaper than a solid brass shower head. With those out of the way, let’s begin!